We've recently studied bridges in Yolo and Napa Counties in Northern California. 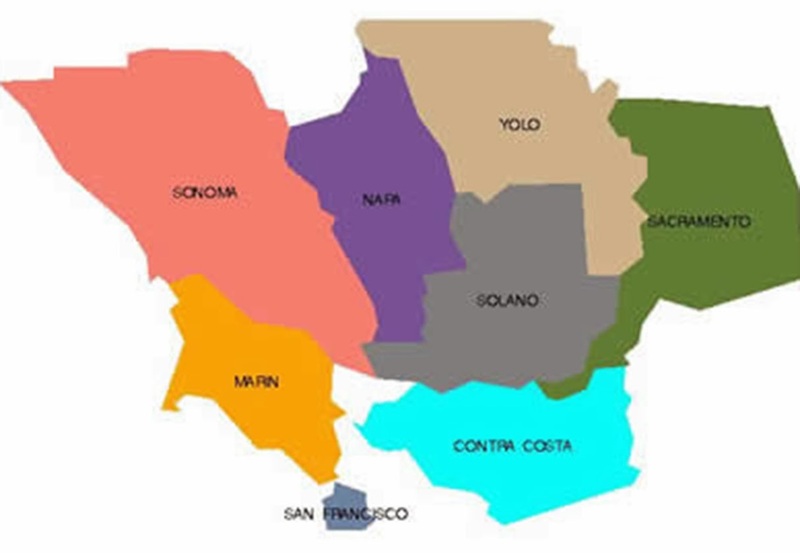 We'll now begin looking at bridges in Solano County, which is just to the south (as shown on the map below). At the northwest corner of Solano County (just below Lake Berryessa and Monticello Dam) Putah Creek becomes the boundary between Yolo and Solano Counties. Five miles to the east is where the deep, winding Pleasants Creek empties into Putah Creek. The creek and the surrounding valley were both named after the early settler J. M. Pleasants. We are going to spend the next few days looking at bridges that cross Pleasants Creek. The Putah Creek Road Bridge (23C0047) is a closed spandrel reinforced concrete arch that was built in 1907 over Pleasants Creek. The arch is 44 ft long but the spandrel walls extend on both sides giving the bridge a total length of 89.6 ft. This bridge was widened in 1963 with a 'T' girder extension. The widening makes the bridge 34.5 ft across, which allows for shoulders, but also prevents this old bridge from being registered as a historic place. In the photo below we can see how the T girder widening requires abutments and wingwalls to support the superstructure and to hold back the embankments. The asphalt overlay effectively hides the longitudinal joint or perhaps they cast a new deck over the existing bridge and the widening. The bridge has a sufficiency rating of 83.1, which is great for a 107 year old bridge. Solano County, California Bridges: Putah Creek Road Bridge across Pleasants Creek by Mark Yashinsky is licensed under a Creative Commons Attribution-NonCommercial-NoDerivatives 4.0 International License.